The WE9003Z is Cartier's Ballon Bleu series model with a thrilling combination of 18k White Gold and Diamond. This wristwatch is a gorgeous statement of luxury and sophistication. 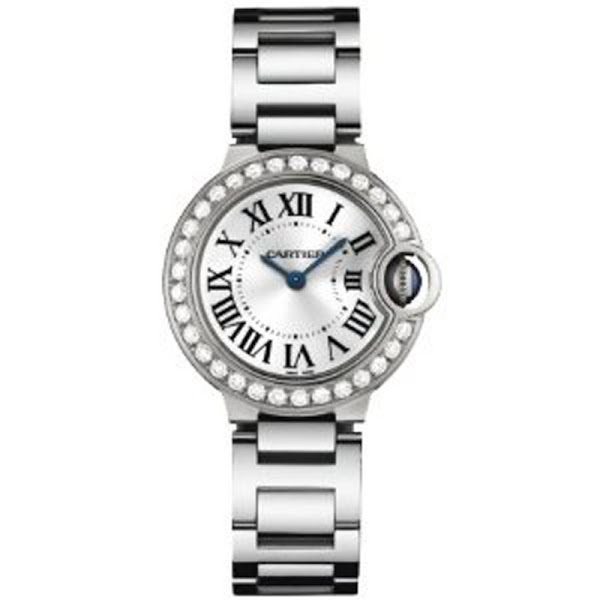 This Cartier watch features a scratch-resistant sapphire crystal and a fixed 18kt white gold set with diamonds bezel. This watch also comes with an 18kt white gold fluted with sapphire cabochon crown, a deployment clasp and a solid case back. This elegant timepiece begins with an 18kt white gold case with an 18kt white gold bracelet. Furthermore, the WE9003Z model wristwatch's dial has a silver opaline dial with blue hands. This timepiece has a Roman numeral hour markers, a minute markers around the inner ring, Luminiscent hands and dial markers. This watch is powered by battery operated calibre 057 quartz movement as well as water resistant level up to 30 meters / 100 feet. In case you'd like to order yours, just saying, this Cartier Ballon Bleu's original price is $31,350. You can find an original Cartier WE9003Z3 Watch at the site(s) listed above. However, we don’t guarantee its availability as being listed here simply means that those site(s) has the item in question by the time we wrote the review. The review in this page is written by garnish at Friday, September 23, 2011. The post is tagged as analog, cartier, diamond, quartz, watch, white gold, women.